Mexican beauty blogger Yuya was the most subscribed beauty content creator on the video platform with 23.59 million subscribers to her channel in April 2019. Fashion- and beauty-related content such as makeup and skincare tutorials, cosmetics hauls and product recommendations are among the most popular content on YouTube. In 2018, beauty-related content on YouTube generated more than 169 billion video views, up from 59 billion views just two years prior. The most popular types of beauty content videos on YouTube are campaign films, favorites/reviews, and tutorials. Despite the popularity of campaign films, it is actually user-generated content by beauty vloggers and influencers that drives the views: As of August 2018, influencer views accounted for 60 percent of beauty content views on the video platform, while brands and publishers only generated 39 and one percent of views respectively. 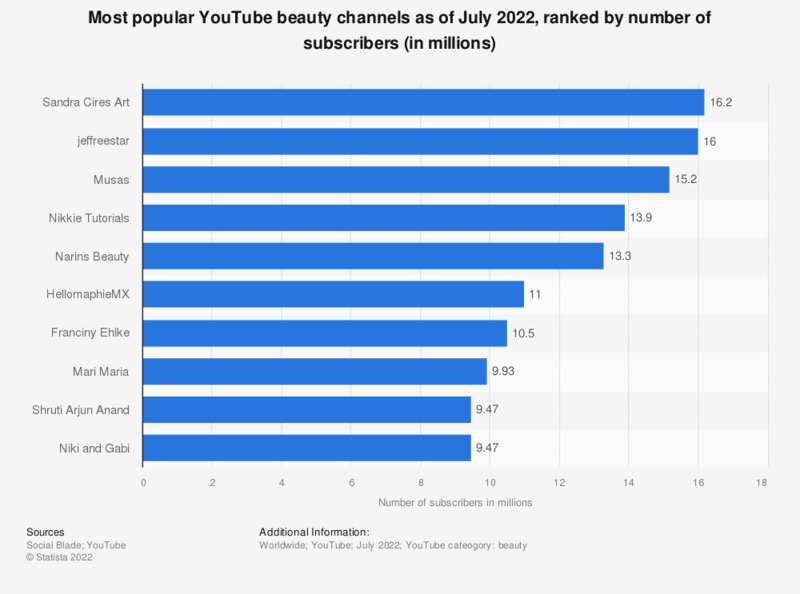 For female consumers, YouTube ranks higher than TV in terms of its appeal for inspirational beauty content and a third of female consumers also reported to watching YouTube beauty tutorial videos at least occasionally. Excluding other subscribers to creators' other channels. Content creators, excluding brands. Creators whose main focus is beauty and style content.